I have been feeling a little guilty for the negativity of my last post. Shortly after I wrote it, I hauled out my Osho Zen tarot deck and gave myself a reading. And the predominant card that came up was the Courage card, in the position of “repression,” as in, what was missing in my life was my courage. And that rang very true. 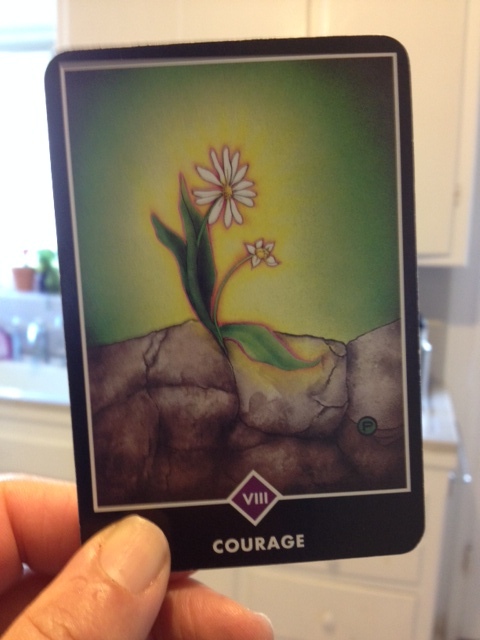 I love the Courage card–this scrappy daisy pushing up through a crack in a rock; it has come to me before and always reminds me that negativity and pessimism are just another expression of fear. It also reminds me that anything is possible. I had all these brilliant thoughts about this last week, all these very Zen, very mindful thoughts–but today as I’m trying to write them down, they’re all gone, save the imperative I have given myself to keep moving forward, through the fear, and to carry courage with me as I go. Because IVF is not for the faint of heart, people. (Aside: the root of the word “courage,” of course, being coeur, French for “heart.”) It somehow hadn’t registered with me how many opportunities there would be for disappointment along the way. That’s not quite true; of course I knew; but I hadn’t focused on how there would be this day-to-day roller coaster of emotions. To wit: when I last wrote, I was injecting my belly with stim drugs every day, and there were nine follicles. Then there was that appointment with the nurse who told me somewhat coldly that if there weren’t at least five mature follicles, we wouldn’t move forward. Then there were all of a sudden fifteen follicles, but we weren’t sure how many were mature. Then there was the egg retrieval, and the doctor got a whopping ten eggs and sent them off to the lab. That was on Friday, and it was a good day. But on Saturday morning, we got the bad news that of those ten eggs, only two had fertilized normally. We spent the weekend in tears and triage mode, poor L confused about why there was so much weeping, so little laughter, so much heavy energy in the air. Then Monday, the doctor called to say that the two embryos looked terrific–grade A embryos, all normal cells, good news. The roller coaster was back up. Wow. It feels a little like being on the edge of a knife, and this–baby–could topple in either direction; into existence, or gone forever. I know that in this moment there is every reason for me to find as much courage as I can, and what else can I do? We will get another phone call in the morning, telling us whether #1 embryo has also arrested or whether it has progressed from an “early blastocyst” to a regular-old blastocyst. And if it has, it will be instantly frozen and be suspended in time until my body is ready to receive it. And then there will be more terrible waiting, not knowing, and uncertainty. But there’s no way to get there but to keep moving forward. Thanks for listening, readers, and for me keeping me in your thoughts. Categories: Uncategorized | Tags: courage, dukkha, embryos, infertility, IVF, mindfulness, negativity, Osho Zen tarot, tarot, Zen | Permalink. As I wrote the title for this blog post I remembered how there is a tarot card in my Zen Osho deck called “Fear of Flying,” and I think, though I don’t have the card handy, that it has to do with fear of jumping into the unknown and the idea that all of us need to get over that fear in order to live. But I meant it quite literally: I’m terrified of flying. This is relevant because I’ve come to Boston to visit my folks for a long weekend and this afternoon, I have to get on an airplane. I am dreading it so much that I actually called to find an earlier flight, and paid $50 to change my ticket, just so I can get it over with sooner. I don’t know what about the experience I like the least: those hours upon hours crammed into a seat, the claustrophobia, the emotional piece of it—in order to see my family, whom I love and miss, I have to endure this experience—or, simply, my terror that the plane will crash. 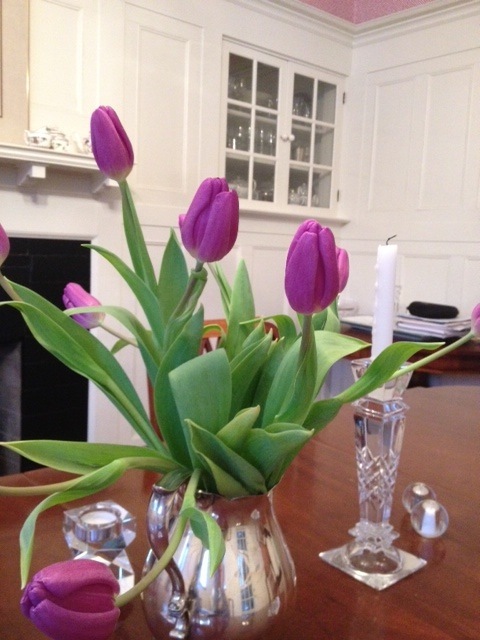 Suffice it to say I’m trying to be calm today…and it’s not working. I wish this didn’t happen every time I have to get on an airplane, but it does. I meditated and did my yoga this morning, I’m doing my best to show up, and I’m feeling like a bit of a wreck nonetheless. I’m wondering whether I need to stop thinking of “fear of flying” so literally. Maybe my fear of airplanes is related to my fear of jumping off into the unknown. Oof, it’s a journey, isn’t it? On a lighter and more fun note: I downloaded Insight Timer for my phone, and have used it to meditate the last two mornings. It’s so nice because I don’t have a singing bowl, and if I did, I’d want someone else to ring it for me. Insight Timer gives you these lovely bells to start and finish that sound a lot like the real thing. Categories: Uncategorized | Tags: fear of flying, Insight Timer, meditate, singing bowl, tarot, Zen | Permalink.